Posted by Teresa Mihelic HelpDesk on Monday, April 1st, 2013 at 11:43am. 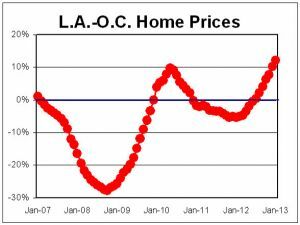 We have been hearing it since the beginning of this year: Orange County Home Prices are going up. They have actually been going up since July of last year, when we first started seeing the trend and the 'turn around' in the market. We had seen 3 key indicators showing the trend and now the S&P Case-Shiller index was the fourth key indicator showing that local home prices increased in January. The other three –CoreLogic, DataQuick and the California Association of Realtors – showed that in Orange County, the home prices have gone up from anywhere from 11.5% to 17.3% since the beginning of the year. Case-Shiller is the only one of the four that didn't report prices for just Orange County ( they combine LA-OC as a metro area. Most buyers though don't need these indicators. If they are trying to buy a home right now, they are experiencing fierce competition, with homes going in escrow within days of being listed, with multiple offers and with a final sales price above the asking price. In some of the local markets where we work, Realtors with clients that want to purchase in a specific neighborhood have been returning to the old technique of knocking on people's doors and asking if they are or know of someone who will be listing soon, as the market is so competitive, it might be the only chance their clients have to get a home right now. Loan rates are still at historic low rates, and there's a sense of market stability all over again, encouraging those buyers who were on the fence about buying a home, finally ready to pursue their dream of home-owning.